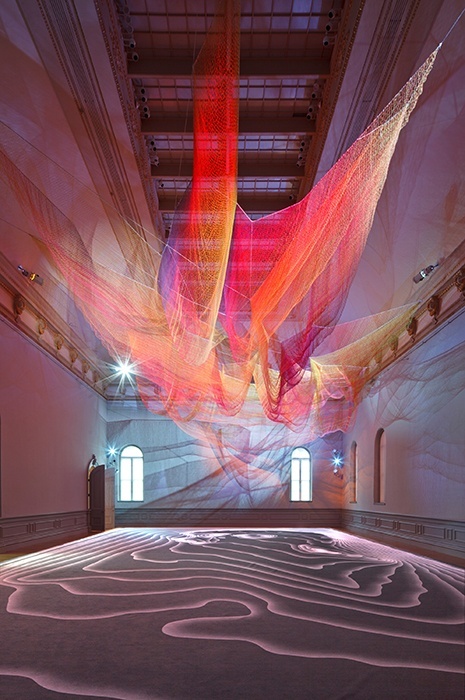 The opening exhibition WONDER features site-specific, gallery-sized installations by nine major contemporary artists, including Maya Lin, Leo Villareal and Janet Echelman. These larger-than-life installations comprise surprising materials worked in transformative ways that explore new directions in craft and transform the Renwick itself into an immersive work of art. Each artist has taken over different galleries in the building creating nine independent installations all inspired by the Renwick. 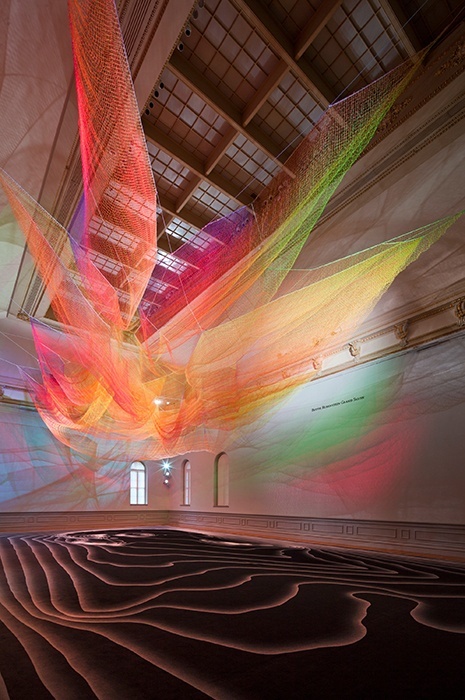 Janet Echelman explores volumetric form without solid mass, overtaking the museum’s famed Grand Salon with a suspended, hand-woven net surging across its hundred-foot length. The complex form is composed of many layers of twines, knotted together in vibrant hues that interplay with coloured light and shadow drawings on the walls. A carefully choreographed lighting program subtly changes the experience of sculpture with every perspective. Visitors find themselves transported into a dreamlike state, gazing skyward at an ethereal choreography of undulating colour. An important part of the installation is the ege carpet designed to complement the sculpture suspended from the ceiling and to aesthetically flatter both the sculpture and the iconic Grand Salon. Numerous designs were trialed before reaching the final textile typography of an aerial form, in monochromatic hues. Eliminating colour and focusing on undulating lines strengthened the result achieving a playful contrast to the vibrant hues of the voluminous net. 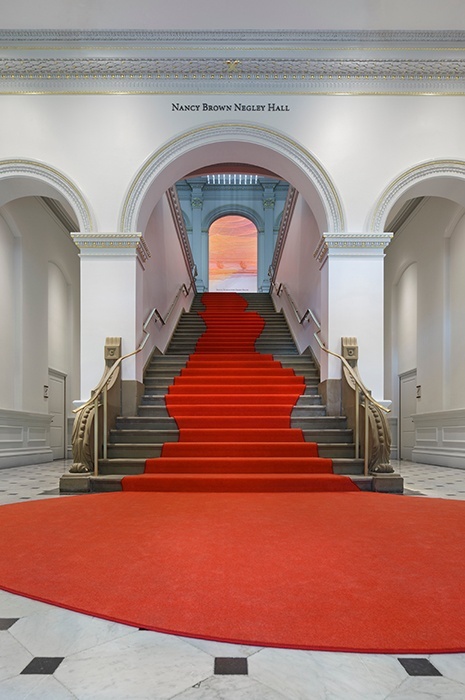 ege was also invited to join a staircase design collaboration with Smithsonian American Art Museum resulting in a dramatic modern take on traditional red carpet. French architect Odile Decq’s organic puddle shape in two custom hues is completed by the ultra-opulent texture on the luxurious 80/20 wool-nylon quality enticing art lovers up the stairs to the Grand Salon.